Get a sense of the local culture at Bosque de Chapultepec and Coyoacan. Get some historical perspective at Historic Center (Centro Historico) and Metropolitan Cathedral (Catedral Metropolitana). There's lots more to do: take a stroll through La Condesa, examine the collection at National Museum of Anthropology (Museo Nacional de Antropologia), pause for some serene contemplation at Basilica de Santa Maria de Guadalupe, and delve into the distant past at Museo del Templo Mayor. 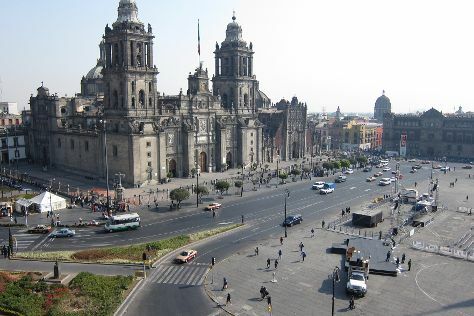 For traveler tips, maps, reviews, and tourist information, refer to the Mexico City trip builder site . If you are flying in from Spain, the closest major airports are Licenciado Benito Juarez International Airport, Querétaro Intercontinental Airport and General Francisco J. Mujica International Airport. In April, plan for daily highs up to 31°C, and evening lows to 15°C. Finish up your sightseeing early on the 5th (Fri) so you can travel back home.